please do not call before 9am or after 9pm UK time. 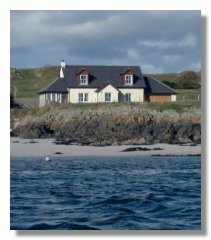 Iona is one of the Inner Hebridean Island and is situated just 1 mile off the South West tip of Mull. Trains and buses run daily from Glasgow to Oban and from Oban you must take the Calmac ferry to Craignure on the Isle of Mull. (Car & passenger ferry). You can then either drive or take the bus to Fionnphort where the Iona ferry departs. Vehicles must be left in Fionnphort & there is a free car park adjacent to the Columba Centre. 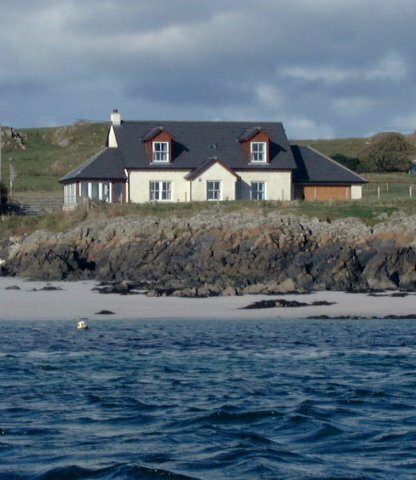 Once on Iona turn left at the top of the pier & Shore Cottage is the 1st house on the right hand side - opposite the converted church at Martyr's Bay - about a three minute walk. Please note that smoking is allowed on the patio and outdoor areas however the entire house is a smoke free area.